It all started when Jeff Miller hooked me up with the KKoA at it's first model show in Salina, Kansas. I thought about it and a couple weeks later I told Jeff I would shoot the show. Within days I got a call from Elden Titus confirming the details of the trip. That was the start of a great, but too short lived friendship. Elden knew I built kustoms and kept prodding me to do a show rod. Finally I agreed to do my first show rod if I could build the next car he was going to build at the same time. He thought that would be a great idea. Unfortunately I never received all the information I needed to get started. .
About a month later I saw the ad for the Salina 2008 show on the back of the Trendsetter magazine. 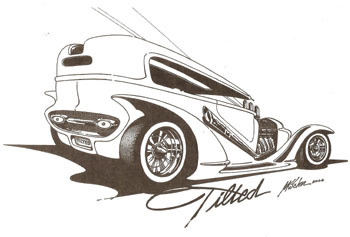 It was a show rod, drawn by M. K. John and I knew instantly I had a show rod I could build. I called Elden and told him I was switching horses until I got more info I needed on his car. He was very enthused that I was going to build that particular car and he told me the guy that drew the picture would get a kick out of it too. That started an 8 month project that took 95% of my modeling time until it was done. Then I heard of Elden's illness and the fact that his time was limited I started working like mad to get it finished. I wanted Elden to see the finished project. Unfortunately the end came faster than anyone had anticipated and the model wasn't finished in time. Then came rough 6 week period, first Elden passed away, then another friend, Bob Paethe passed away and finally Karen, my wife of nearly 39 years passed away. For about a month "Tilted" sat quietly in a box with all the finished components needed to complete the build. After some weeks the time came to finish the model. I feel it is a tribute to both Elden for his friendship and inspiration and my wife who put up with my crazy hobby for all those years. Body: '32 Ford Sedan, Switcher's kit, chopped w/ A & B pillars removed and scratch made trim added around side windows. Speedwagon front fenders, firewall and running boards. Rear fenders from a Mono '53 Corvette, they were reversed and sectioned. Grill shell from AMT '32 Ford Sedan with head lights removed and Replicas & Miniatures of Maryland Buick headlights added and molded in. The grill is etched metal mesh with straight pin heads added to simulate cabinet knobs and the rear grill shell was scratch made and etched metal mesh and a shortened Olds grill bar inserted inside, the turn signals were turned into the tail lights. Chassis: Speedwagon, modified with new cross members, front and rear axles and radius rods. The front shock mounts scratch made and the shocks are from parts box. The steering box was relocated and drag link scratch made. Engine: From the '57 Chrysler 300, valve covers Revell, 41 Willys, exhaust system and Hilborn mechanical fuel injection scratch made, injector tubes were aftermarket. The fan and the power steering unit were removed and generator and pulleys were modified. Interior: Original AMT '32 Ford sedan were used. The dash came from the parts box and the trans tunnel reworked. The final step was to flock the interior in Brown and Tan. Wheels & Tires: The wheels, original AMT '32 Ford sedan kit with chromed bullets added to the centers. The front tires are from the '50 Ford pick up and the rears are resin white walls from Modelhaus. with Alclad used on all the chrome parts.